I love these as a camping recipe because you can do most of the prep at home then throw it together at the campsite with minimal dishes. Very easy. 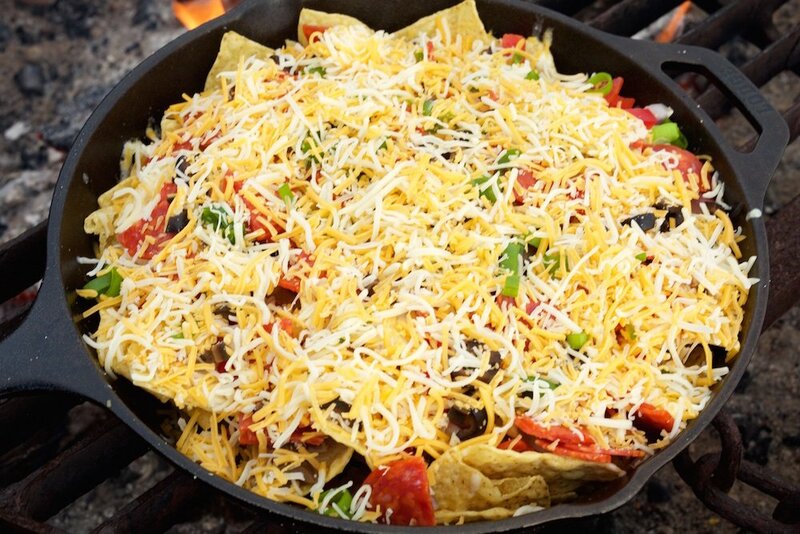 If you aren’t camping, you could also make this in the oven at home (just pre-heat your oven to 400 degrees). Garlic Cream Sauce: Melt the butter and olive oil in a ssaucepan Once the butter is melted, add the minced garlic. Stir. After a minute or two, add in the cream and milk. Stir until it comes to a boil. Add salt, pepper, red pepper flakes, and cheese. Stir until sauce has thickened. Once it has thickened, remove from fire and set aside. and add the tortilla chips. Drizzle the garlic cream sauce all over the chips. Garlic Cream Sauce: Melt the butter and olive oil in a saucepan Once the butter is melted, add the minced garlic. Stir. After a minute or two, add in the cream and milk. Stir until it comes to a boil. Add salt, pepper, red pepper flakes, and cheese. Stir until sauce has thickened. Once it has thickened, remove from fire and set aside. Yum! Such a great recipe idea. 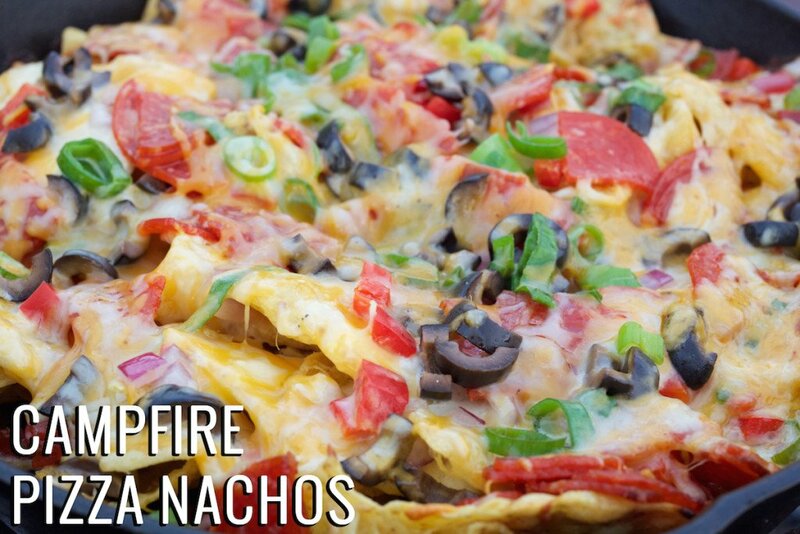 I’ve never tried pizza nachos, but they sound delish! I love cooking with cast iron. The cheese really makes this dish, how fun! I feel like going camping right away! this does sound like a smart and comforting camp fire food which everyone will enjoy. 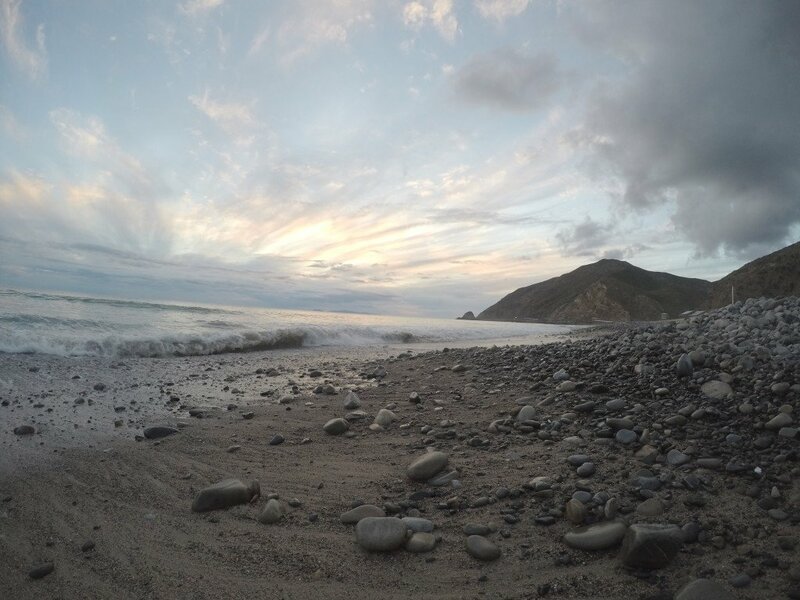 You got me super inspired right now, I want to plan our next road trip to the Himalayas. 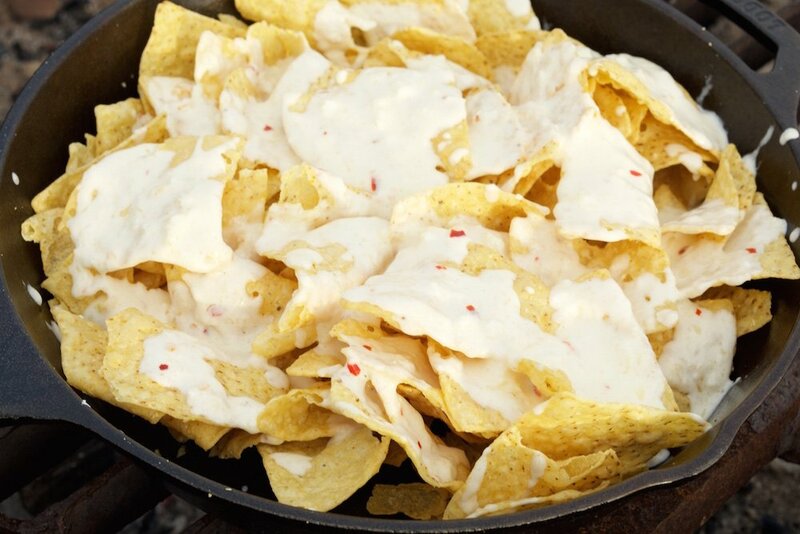 These nachos look beyond incredible, but I fear I’d just eat all the garlic cream sauce with a spoon before I ever got around to making them. What a fun family night recipe! No campfires in my immediate future – I’m just going to have to make this over a stove… Bet it’ll still be good! Welp, I love (LOVE) nachos, and I love pizza, so I’m basically ready to reach through my computer screen and grab a chip. Can’t wait to try these!! 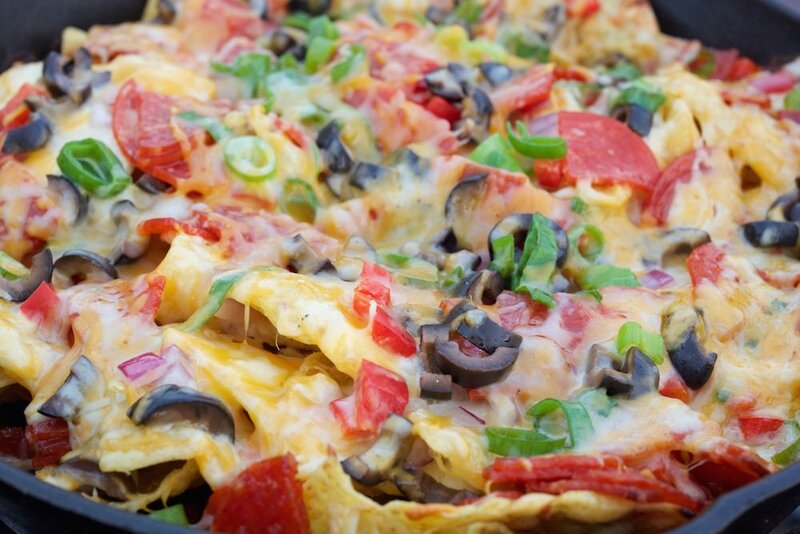 I love these nachos, delicious, quick and easy is the name of the game around here for snacks! I think I will add mushrooms, maybe some sausage too. It looks divine. Could you make the cheese sauce ahead of time? Can the sauce be made ahead of time?? Asking the same as the others…can the sauce be made ahead of time? My family doesn’t camp but I make this recipe and bake it in the oven at about 400 degreesand i. A 9×13 panda since I do not own a cast iron skillet. This is one of my absolute favorite recipes! The cream sauce is AMAZING!!!!!!! Thank you for sharing the recipe. ? I definitely give this a five star! I’ve made it a few times and everybody loves it. I added my own touches by sauteing mushrooms in the butter with the garlic and onions. I also added Italian sausage and only half the pepperoni.